I’ve lived in Colorado all my life and have visited Boulder countless times. 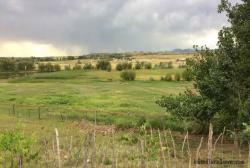 But I had no idea that Boulder county had mile after mile of absolutely beautiful, pastoral land. Gently undulating hills, pastures, creeks, groves of trees, farmhouses that are all so beautiful it somehow seems a surprise that it’s all right in the backyards of us front-rangers. I know it’s ungodly hard work but I am in love with the concept of farming – it’s basic, earnest, real and unites humans, animals and nature, nurturing us all. If it wasn’t for farmers, we wouldn’t have food, plain and simple. I was humbled to meet a few of the farmers and to see their operations.